by DURANDO, Guielmo [Guillaume Durand], Bishop of Mende (ca.1230-1296). Lugduni [Lyon]:: Haeredes iac. Juntae, 1559., 1559. Small 8vo. , 483 ff. Later vellum with title mounted on spine. Title inscribed by early owner "Ex libris Ovii - Congregationis Asculi." Additional ownership signature of F.W. Hyne-Davy. FFEP with early manuscript Latin inscription. PRINTED BY JUNTA: The Rationale divinorum officiorum, a liturgical treatise written in Italy before 1286, on the origin and symbolic sense of the Christian ritual. It presents a picture of the liturgy of the 13th century in the West, studied in its various forms, its traditional sources, and its relation to the church buildings and furniture. With Martene's De antiquis Ecclesiae ritibus it is the main authority on the medieval Western liturgies. It has run through various editions since its first publication in 1459. This copy with frequent ink marginalia throughout in an early hand, presumed from the "Asculi" origin [see title]. Though there are numerous short entries, the more substantial ones are found on leaves: a5(v), ?i(r), blank facing f. 1, 82, 91(v), 95, 101(v)-102(r), 108(v), 100-101(r), 131(v), 134, 140(v)-141(r), 164(v)-165(r), 169(v), 178-179(v), 190-191, 202(r), 204(v)-205(r), 273(r), 295, 331, 338(v), 346, 363(r), 372(r), 385(r), 394(r), 435(v)-436-437(r), 447(v)-448(r)-449, 453-454(r), 458, 466-467(v). Additional leaves have minor marginalia and others are underlined in ink, though not offensive. The comments of the owner, shown throughout, are fine early extant notations giving the owner's thoughts and understanding of the text. PROVENANCE: I: Ex libris Ovii - Congregationis Asculi - II: Reverend Frank Walter Hyne-Davy was vicar of Nether Wallop. See: Journal of the British Archaeological Association, 1944, p.30. Durand "was born at Puimisson, near Beziers, of a noble family of Languedoc. He studied law at Bologna, with Bernardus of Parma, and by about 1264 was teaching canon law with success at Modena. Pope Clement IV, another Frenchman, called him to the pontifical court as a chaplain and auditor of the palace, and in 1274 he accompanied Clement's successor, Pope Gregory X, to the Second Council of Lyons, the constitutions of which he helped draw up. As spiritual and temporal legate of the patrimony of St. Peter, he received in 1278, in the name of the pope, the homage of Bologna and of the other cities of Romagna. Pope Martin IV made him vicar spiritual in 1281, then governor of Romagna and of the March of Ancona (1283). In the midst of the struggles between Guelfs and Ghibellines, Durandus successfully defended the papal territories, both by diplomacy and by arms. Pope Honorius IV retained him in his offices, and although elected bishop of Mende in 1286, he remained in Italy until 1291. In September 1294 he was present at Orleans at the Provincial Council presided over by Simon, Bishop of Bourges. In 1295 he refused the archbishopric of Ravenna, offered him by Pope Boniface VIII, but accepted the task of pacifying his former provinces of Romagna and the March of Ancona. In 1296 he withdrew to Rome, where he died. His tomb is in the church of Santa Maria sopra Minerva." - Wikip. See: William A. Pettas, A History and Bibliography of the Giunti (Junta) Printing Family in Spain, 1526-1628. 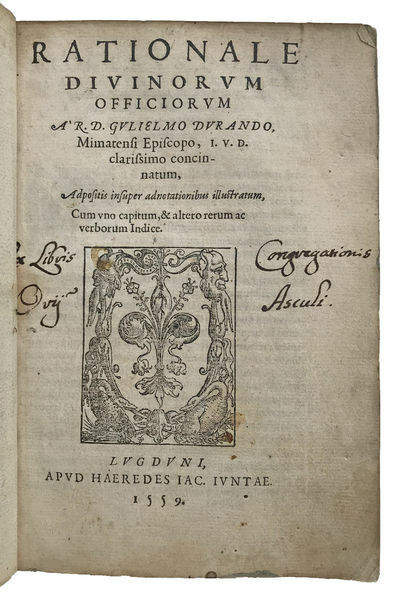 This Work Covers the Junta (Giunti) Press and the Imprenta Real in Burgos, Salamanca and Madrid, With a Brief History of the Several Giunti Presses in Venice, Florence and Lyon, And A Bibliography of the Press of Juan Bautista Varesio in Burgos, Valladolid and Lerma. Oak Knoll, 2005. William Pettas, The Giunti and the Book Trade in Lyon. In: Libri, tipografi, biblioteche. Ricerche storiche dedicate a Luigi Balsamo. Biblioteca di bibliografia italiana, 148. Firenze: I. Olschki. 1997.